Over the weekend in the Destiny 2 Beta Bungie put The Farm live for an hour. The Farm is the new social space in Destiny 2, and the reason it was only live for an hour is because it’s missing pretty much everything that you’d interact with. However, there was still plenty to do and explore in the area, unfortunately it wasn’t possible to leave and explore the European Deadzone but that’s okay. Some players are still in The Farm at the time of writing because you don’t get kicked out, and you can remain there for as long as you’re logged in hilariously. While it was live I took the opportunity to explore The Farm from top to bottom, accomplishing everything possible, including a small glitch. The first thing to note is how beautiful the European Deadzone is. Everywhere I went I could see some stunning backgrounds, including a lovely view of the mountains over a colossal lake. I know I mentioned in another article recently that Destiny 2 is definitely better looking than the original, but it really hits home when you’re not running around shooting and can take the time to enjoy the view. If you remember the purple ball from The Tower then you can be happy, but sad first. The purple ball is dead, I’m sorry but it got destroyed along with The Tower. What we do have is a football pitch, or soccer pitch, with a massive football! I spent way too long running up and down the pitch, defending, goalkeeping, and scoring as much as I could with anyone who would play with me. What I find best about this is the fact that you don’t even need voice chat to make it work. If a Guardian saw me in the pitch they jumped in and started running with the ball immediately. There’s no need to sort out which side you’re on, just go for a goal! The buildings in The Farm are dilapidated at best, with some simply being ruins. However, as I explored each one I found little nooks where it’s clear vendors will be appearing to give you items, missions, and generally lurk out of sight. I have no idea which vendor will go where, but it’s obvious from certain symbols if you take the time to notice them. 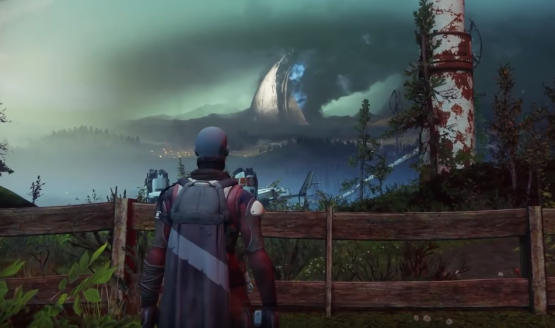 Dead Orbit for example will be at the far side of The Farm where you first spawn in. The Crytarch has his own house, understandably, and there’s also an entire Eververse tent for anyone who wants to spend more money on Destiny 2. Speaking of the Cryptarch, his house held the best glitch and easter egg in the Beta so far. If you ran at the front of his house, aiming for the curtain on the left, and slid at the right time, you’d end up inside the house. Of course you’re not meant to get here and all you can see is a blank room, some odd looking floor tiles, the edge of a fireplace that clips through the wall, and the remains of the piping coming in from outside only to end two inches or so through the wall into the empty room. I’d like to think that because players found this Bungie will add something in and really kit it out as a bit of a surprise for the main game, but we’ll have to wait and see. Finally, probably the biggest part of exploration in The Farm was the rooftops. There’s a large main farm building which you can hop out of a window in and access the roof from. Up here there are wires connecting the building to another across the way, so of course we all attempted, and succeeded, to cross these wires to the other rooftop. I suspect the large radar ball on this second building has something to do with a Warmind, but I’m not certain. From this building again there is another set of wires connecting it to the Cryptarch’s roof, where you can jump onto the waterwheel and have a lovely time walking forwards but getting nowhere. I found a nice little shortcut to the Cryptarch’s roof by jumping onto pipes outside of the house, and using the new climbing ability to get onto the roof from the ground. That’s all that there was in The Farm I’m afraid. It has been said that the area will grow as you play through the story and save more people around the European Deadzone, as well as the rest of the System. I would love to see The Farm expand beyond what I saw, there were tents and a ship beyond the borders allowed to us in the Beta that I could see, so the boundaries may extend a long way beyond what we were shown. Previous articleFrom The Beta – How Good Is Countdown Mode?